I picked up my Silhouette a few years ago on a QVC special. The draw of being able to cut any of my 1000+ fonts on my computer, rather than buying a cartridge for each font or embellishment , proved too powerful and I purchased my very first die cutting system. Now, while I can technically cut out any of my TTF (True Type) fonts, not all fonts are conducive to die cutting. This is especially true of grungy fonts, and really skinny fonts. The skinny fonts cut just fine, but removing and placing them can be a real bear. After some experimenting, I've gotten better at figuring out which fonts will cut well, and which just make a big mess of paper snips. As for the actual function of the machine, I've personally used the Silhouette to cut adhesive backed vinyl, cardstock, thinner patterned paper and the QuicKutz Quick Strips (adhesive backed textured cardstock). I've had pretty good luck with cutting all of them, although getting thinner paper off of the sticky mat can be a real pain when the mat is brand new, and thus super sticky. The Craft Robo software that comes with the machine leaves something to be desired, although their recent update of the software did make some positive improvements. I don't like that there is no feature to show you where to position your paper on the sticky mat, so you know where it's going to cut. The controller window (the screen that shows up when you're ready to cut) is a little confusing. After a few cuts I got it figured out... just don't use your one of a kind papers on your first few runs. The Silhouette comes with 3 different adjustment caps (blue, yellow and pink) that adjust the depth of cut for different materials. When you select the media type (cardstock, vinyl, etc) in the controller window, it will tell you which cap you should use. These little guys are easy to lose, so I keep the baggie taped to the back of my computer monitor. The one preset I have consistently changed in the controller window is the speed of the cut. I almost always slow it way down. It seems to help keep the cuts, especially the corners, from getting torn up. The one technical problem I had with my Silhouette when it arrived was an ill-fitting power cord. I called up QVC to have a new one shipped out. The new one didn't fit well either. My handy husband figured it was actually the fitting inside the machine that was the problem. With much fuss he was able to get it shoved in there, and left me with this instruction, "Never ever unplug this if you want it to keep working." I'm not sure that this is an issue with all of the machines, but it was something I encountered with mine. QuicKutz offers a Digital Download Library where you can download different shapes, boxes, frames and elements right into the "library" on your computer. Each element is $1.99 and you can purchase them individually or by monthly subscription. I haven't been terribly impressed with their search engine, but i did find elements that i found worth the download. Through the wonder of the world wide web, there are loads of free shapes out there in the form of dingbat fonts. Yea internet! A quick Google search for "free dingbat fonts" will reap hundreds of sites and hours and hours of time wasting fun. One word of warning on the dingbat font sites... there seem to be a lot of naughty dingbat fonts (R & X rated). What's up with that? Just giving you the warning if you're searching while little eyes are near by. I've had my machine for a couple of years and have no problems with it. The only item I've replaced are the sticky cutting mats, which is to be expected. I think that just now my blade is getting to a point where I'll need to replace it soon. If you're a big fan of die cutting tons of fonts and shapes, this is a great tool. Admittedly, I have not used it as much as I thought I would. I think part of that is my affection for Thickers and other ready-to-go alphabets. But the main reason would be that I'm a lazy scrapper. In the process of scrapping, the thought of getting the paper in the right place on the mat, and cutting what I want without tearing it or wasting a bunch of paper is sometimes daunting. So I skip it for something I have on hand. There are, however, several times where I've found it invaluable! I've been able to cut extra large letters for a display boards for work, church and school projects. 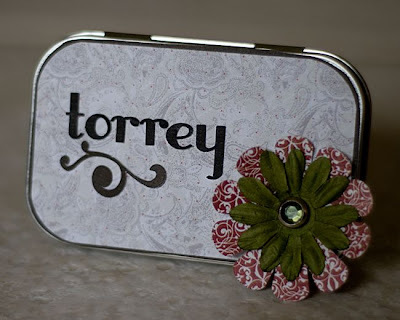 For making personalized goodies and party favors. Possibly one of the most fabulous the-Silhouette-saved-my-bacon moments was when I was making 100 ornaments with "USA" on each for Veteran's day. Buying enough alphabets to provide for all of those would have been insane. However, cutting 100 perfectly spaced USA's out of self sticking vinyl was easy and cheap! With an MSRP of $369.00, these babies don't come cheap. If you're looking at other die cutting machines, that you'll end up buying $600 in cartridges for... this machine would be worth the trade off. Bottom line, if you're going to sink the money into one of these, evaluate your scrapping and personality first. Really make sure it's something you'd use enough to make it worth your (or your husband's) hard earned money. - The ability to cut hundreds of free fonts I already have on my computer in virtually any size. - Being able to cut through the most common scrapping materials, as well as self sticking vinyl. - Not being able to tell where to place different sized papers on the sticky mat. - The cost. It's just plain expensive to get one. Do you have the Silhouette or the new Silhouette SD? Do you love it or hate it? Have you used another machine that you love? Tell us about it! So informative and has really helped me in making a big purchase decision. I have the cricut expressions and I love it. So far I have had no problems with it and I am going to be getting the software that allows you to cut ttf as well. So my big thing is getting shapes that I want without buying it all KWIM? I love the Silhouette. I got mine shortly before Christmas. Quickutz is now offering lots of new designs monthly which I like. I find myself adding to my library on a regular basis. :) I also love the ability to resize the designs to fit the project I am working on. 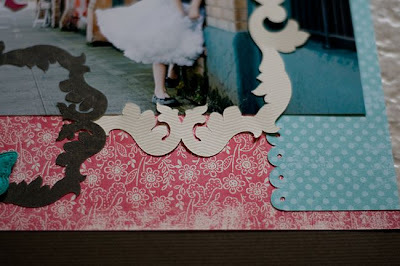 For a thicker cut, I cut 2 pieces the same size out of heavy cardstock and glue them together. That has worked well for me although it is a little more work. I also got my machine for $149, making it more affordable to me. I have not purchased any CDs for it except for one. The Christmas one was offered at a very good price and I picked it up. It had lots and lots of great designs on it. When finding dingbats that you like, do you just download them in your computer's font's folder and resize them like you would a font? Thanks for your product reviews. I love them and always look forward to the next one. Just to clarify - it sounds like your review is on the old Silhouette machine (and the picture is the older machine too). I just got the newer Silhouette SD that has grid lines on the sticky mat and that is a definite plus. I never thought I'd get a digital cutter, but am glad I did. I got mine from scrapyland on sale (and it's msrp was less than the one you reviewed). I really like the new Silhouette SD, but am still learning how to get the best use from it. 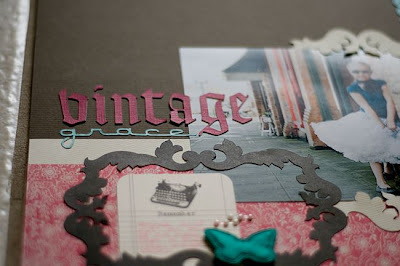 Thanks for the link to the fonts - love finding free things to use for my scrapping! I am a huge fan of the QuicKutz products, the Squeeze & the Revolution. However, my Silhouette & I had never really gotten into the LOVE feeling I have for the two forementioned. I had trouble with my Silhouette from the very beginning not cutting cleanly. I soon became frustrated after many attempts and sold mine recemtly at a garage sale. Now I still LOVE my QuicKutz Squeeze & Revolution and the 12 inch extension to the Revolution, but I'll stick to my Cricut for the machine of choice! I have the original Cricut and about 35 cartridges. I sort of bought it on a whime without doing much research on die cut machines. I like that I don't HAVE to connect my Cricut to the computer. I recieved the software as an Xmas gift and like the freedom it has given me. Thanks for the great review!! 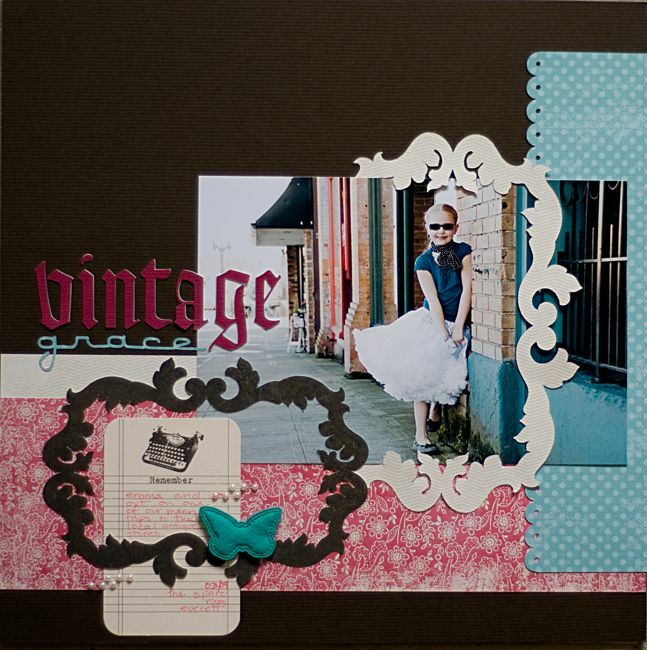 What font did you use for Vintage and Grace in your layout? Great review, I have wondered about the versitility of this machine since I recently saw some cuts on a layout at a retreat I went to. I was ready to hop on the Slice bandwagon but a friend made me see that the Cricut I already own does all that the Slice does so why bother. I've recently begun getting re-aquainted with my Cricut. I have a Craftrobo Pro- I had originally gotten the basic craftrobo but I couldn't get it to work correctly and when I called the company about my problems I returned the craftrobo and got the pro instead. I love my pro- it cuts all of what the shilouttee does but also cuts through chipboard and thicker items without many problems (although I do multicut). I love using TTF and I have many files I created through the autotrace software and have purchased from various places on line as well as free files from file sharing groups and blogs. It did not take me long to figure out where cuts were placed on my sheets most of the time but I switched over to using a cricut expression mat instead of the pro mat and I love the gridlines- it makes it even easier and goes through my machine fine. The pro is significantly more expensive (it qwas $1000) when I bought it a few years ago but I would have spent that in letter stickers or dies and layered stickers- almost every page I do (close to 1000 a year) has items cut by this machine on it. I also have a cricut expression- I bought it because I wanted a few shapes cart (I don't bother with the fonts). On some things I find the cricut easier but for creating paper piecings and such my craftrobo is much easier. I have the Silhouette as well and purchased it before Christmas for about $200.00 CDN. I too am not "in love" with it yet...but hope to learn more about the machine and what it is capable of doing. I think I just need a bit more practice. I have used the Silhouette for titles, but not much more. I also found it a bit of a learning curve to determine where it will cut and have wasted a few pages of paper because of this. I am not a fan of the sticky mat and plan to purchase a Cricut mat that I can cut to the 8 1/2 x 11" mat size to fit the Silhouette. I have one and I love it. My friend has figured out how to turn pdf's into files for the silhouette so anything I find on the web she can convert for me. It's awesome. Wish I had her brains. I do enjoy being able to use any TTF that I see. That being said I also have the Expression which is nice to take to crops since I dont' have to lug my computer around. Now that Quickutz has came out with a new version that has an SD slot so that we don't drag our computer makes me wish that they would come and attachment through the USB port so that we can do the same thing to the old version. Oh and I bought mine for $135 inclusing shipping. You just have to do your shopping and see what you find out there. Thanks so much for the info! I'd looked into the CraftRobo a few years ago, but the price turned me away. Thanks for the great info! I've used the Silhouette a number of times at the lss where I work and love it! It would definitely be my die cutter of choice if I was looking at buying one. I love that it is so versatile in cutting so many different fonts. There is a little bit of a learning curve as was mentioned in your review and I really wish the size of the font on the screen was the actual size of the font that it cut. But overall the pros outweigh the cons. Thanks for posting a review on this tool! I was so in love with this when I bought it ... now I wonder if I know how to use it correctly?? I have the Silhouette pictured above - purchased it almost 2 years ago while I was a consultant for MCL. While I love what it can do (cutting TTFs), I have gotten frustrated at what it actually will do ... it did cut for a short time, but my blade is already dull and I have used it very little. I can't seem to find a replacement blade to purchase ... only the entire system (blade and all 3 adjustment caps) which is around $40. Seems a bit steep for the use I got out of the original blade. I plan to keep this tool and use it - not to replace it - but I guess I need to learn more about it. I don't have a silhouette, mostly because of cost. I think I would like to have one since I always have an idea in my head that I know is on a die-cut template somewhere I could use for a page! I don't have a silouette, but was wondering if it runs both on a mac and windows? I do have a cricut and love it to death...just wish the software available to cut any shape could also be used with a mac. Thank you for this absolutely thorough review. It really helps a lot. I don't own a digital cutter (just the QK Revolution) but I have considered digital. This to me would make much more since than getting one that takes cartridges but because of the price, I think it'll be a while before I get one. Thanks for the article. I think the main thing that has held me back on this machine is the price. But, I do like the idea of being able to use any of my fonts on the computer (the list is long). Maybe, eventually, I might invest in it, but this has helped with me understanding how it works better. thanks for the review - I have a Cricut and like that i can pick up new cartridges on sale here and there so its not too bad. 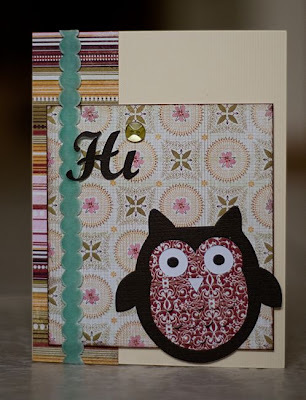 Also - noticed that your journaling card is an exclusive from studio calico (it was in the Dec. kit) not from my minds eye. thanks for the update about the journaling card. i'll fix it in the product list! :) i must have had it filed with the mme stuff. I have a Cricut, but often wish I had invested in a Sihlouette. I like the idea of being able to purchase only the shapes I like and I am addicted to fonts. (Most of my Cricut cartridges are fonts.) The reason I didn't was because I am a Mac user and the Cricut doesn't have to be operated through a computer and I don't have a PC to use with the machine. I used to have a silhouette ( the first one).I hatted it! I found it hard to work with the silhouette. All the settings are in the software..with the cricut, it is on the machine.. I sold my silhouette and bought the Cricut Expression and love it! Thanks for the review. I didn't think I saw this stated anywhere but I was wondering if the silhouette was compatible with mac. This tends to be my major problem with a lot of these electronic things, they don't make them compatible with mac. I currently have a Cricut which I tend to have a love/hate relationship with at the moment. I think I just haven't worked out the kinks of the settings yet. I know they have a software you can use with TT fonts but once again, not compatible with mac. Really annoys me. Anyway, just wondering if you knew. Thanks!! Very nice review and gorgeous page. I have the silhouette and love it. I agree with you on not liking how hard it is to place paper and cut. But all in all, I love being able to cut so many different fonts and they are sooo many great places online to get free files to cut and also places that sell great files for cheap prices. I thought it would keep my qk die spending down but I find I buy just as much, lol. I really appreciated the review. I had been wanting a machine like this and with the reference to Craftdirect I bought one. I really like not being tied to buying the cartridge. Thanks for the review. thanks for posting this one Noel! i really really wanted this baby when it first came out, becasue of my love affair with fonts, and that you don't have to buy cartridges. if i ever did buy a digital cutter it would probaly be this one; unless of course they came out with one that didn't need a sticky mat. i'm also leary about buying this, because i'd be scared it would become frustrating...possible paper jams, tears, or constant $$$ investments. but, nonetheless, i still want one...one fine day! Hi - great reviews and info, thankyou. Does anyone know what format is used when these images are saved to be used - eg jpg, tiff, pdf? I've just got a slice and wondered if it was possible to download my own images onto an SD card to use with this little machine? I am wondering if I should just return it and get a silhouette? Has anyone got or heard or tried a Pazzle cutter? I have a Silhouette too. I call her Sil or Silly and she's my best friend ever! I love creating my own designs and just the idea I could "professionally" cut out my designs thrilled me! Ever since I have her, she has never disappointed me. As for the risk of waisting paper. I cut a piece of paper just about half an inch wider than how large I want to have my plotter cut and place it at the right top of the sticky mat. In the Robomaster program I always place my image bottom left. And there is always the possibility to show the grid in Robomaster, of course. I've never had problems with any cord. It all fitted as it should. The only point of a little disappointement is it won't be able to cut thicker media like chipboard or transparencies, as the engine is too weak to do such a heavy job.